The new second printing of the M1 Carbine Owners Guide by Larry Ruth and Scott Duff is now available. Its a comprehensive look at one of the most popular US Service Rifles of the 20th Century: the M1 Carbine. How do I evaluate and select an M1 Carbine? How do I determine the date of my Carbines Manufacture? These are the questions most often asked by new Carbine enthusiasts. They are answered in The M1 Carbine Owners Guide. Along with the detailed history, evaluation, assembly, disassembly, operating and maintenance information expected from Scott Duff Publications Owners Guides, the M1 Carbine Owners Guide includes never-before published serial number date tables. Carbine Dating, as it were (sorry, couldnt resist the pun!). 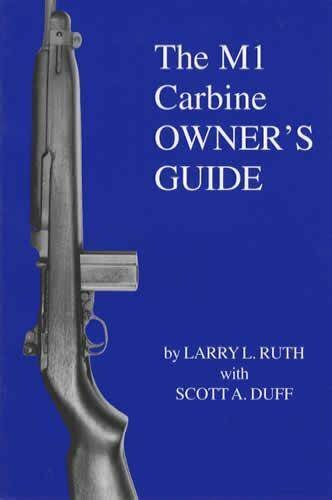 The M1 Carbine Owners Guide has 106 photographs and drawings in its 144 pages. This book is a unique resource that every Carbine owner and/or aficionado should have! !